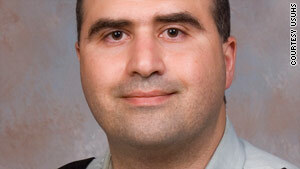 Suspect Maj. Nidal Malik Hasan, an Army psychiatrist, faces 13 counts of premeditated murder. (CNN) -- Military brass at Fort Hood, Texas, on Tuesday announced tightened security procedures and the availability of a range of mental health services in the wake of the November 5 shooting spree that killed 13 people on the post. Steps have been taken to tighten restrictions on who gets onto the post, to position armed guards in key locations including behavioral health facilities, and to carry out random inspections of containers, said Col. Bill Hill, garrison commander. "Relaxed entry will cease," he told post personnel in a televised town hall meeting. All vehicles entering the post will be required to display a Department of Defense sticker or a secure pass, and some buildings will require badge access, he said. Security at both the fort's airfields also will be tightened, with guards and patrols on site, he said. Soldiers assigned to Fort Hood will have to register their personal firearms with the director of emergency services, he added. Fort Hood is home to some 50,000 active-duty soldiers and 18,000 of the soldiers' family members. The suspect in the shootings, Army psychiatrist Maj. Nidal Malik Hasan, 39, has been charged with 13 counts of premeditated murder. Hasan, who was wounded by two civilian officers, is being treated at a hospital. Additional charges are under consideration, Col. Jeff Harris said. Many of the security changes have already been implemented, including additional searches at the gates and greater restrictions on who can get onto the post, said Lt. Gen. Bob Cone, Fort Hood's commanding general. But, Cone said, had the changes been in place on November 5, they might not have been enough. "I don't think necessarily they would have had an effect on this event," he said. Among Fort Hood's resources for treating mental health problems -- including post-traumatic stress disorder -- are a 12-bed inpatient psychiatric ward, an outpatient clinic, a combat stress reset program, social services and substance abuse treatment, said Dr. Steve Braverman, commander of Fort Hood's Carl R. Darnall Army Medical Center. After the attack, the post's mental health staff was augmented by 75 to 80 mental health workers, though some have gone back to other assignments, he said. Soldiers affected by the attack were screened for mental health problems afterward and will be rescreened 90 days after the event "to ensure that any previously unidentified issues are addressed," Braverman said. A 24-hour "behavioral health hot line" is available, and a surveillance program "to identify and monitor areas of concern" will be started soon, he said. "These findings may lead to targeted interventions for certain populations as we address these issues," Braverman said. Plans call for construction of an 82,000-square-foot facility in which behavioral health facilities would be consolidated, Braverman said. Soldiers in need of care can also make appointments with their primary care providers, he said. The objective, Braverman said, is "to restore trust and confidence in Army medicine." Despite the availability of resources, many soldiers have expressed reluctance to seek mental health care, fearing that doing so would adversely affect their careers. "There is a perception of stigma," Cone said. But Braverman said treatment need not hinder anyone's career. "If you are seen in our system, while there's information in the medical records, that's not allowed to be used for any determination of security levels or future assignments," he said. "This is really all about us regaining the trust in our community, in our soldiers, in our security, in our installation," Cone said. "That was taken from us, and what we have to do is take it back, and that is done one person at a time." He added: "If there is someone out there who is hurting, I assure you there are resources in place and we can take care of them."